…And Get The Best Service Ever! So you typed “CustomInk” into Google and clicked on this page? Congratulations! We’re going to save you a ton of money and provide the best customer experience ever! We carry the same products as CustomInk. We decorate those products in a modern production facility in Concord Massachusetts. We have been embroidering apparel well before CustomInk was even a gleam in some venture capitalists eyes…more than 35 years. CustomInk is a fantastic company, but they got their start in the world of screen printing not embroidery. For many years embroidery was a necessary evil they offer in order to satisfy their customers. 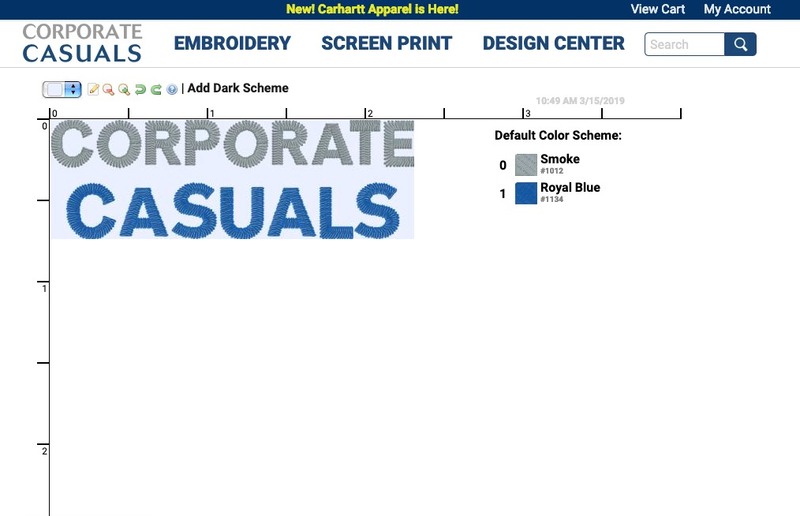 Corporate Casuals started embroidering apparel over 35 years ago and then added screen print and digital printing. 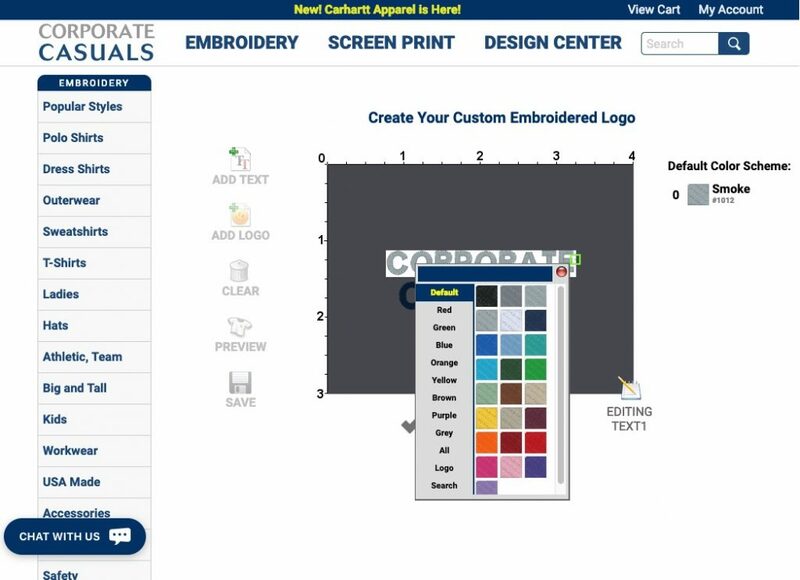 The CustomInk design studio is great but it’s optimized for print, not embroidery. When you select a color for a design element what color thread will be used? How will the stitches look in your logo? You can’t tell, its a print design studio. Just a quick legal note on these screen shots. Custom Ink and the Custom Ink octopus Inky are trademarks of CustomInk. We happen to think Inky’s design is brilliant! Our embroidery optimized design tools show you exact thread colors, names, and can even render the stitches in your logo. Every color you select in our studio corresponds to a Madeira thread color and a Pantone color. Monitor colors can vary when in doubt ask for a stitch out (hey that kind of rymes). We provide free stitch out’s as part of our fanatical customer service. Our design studio produces industry standard Tajima DST files. 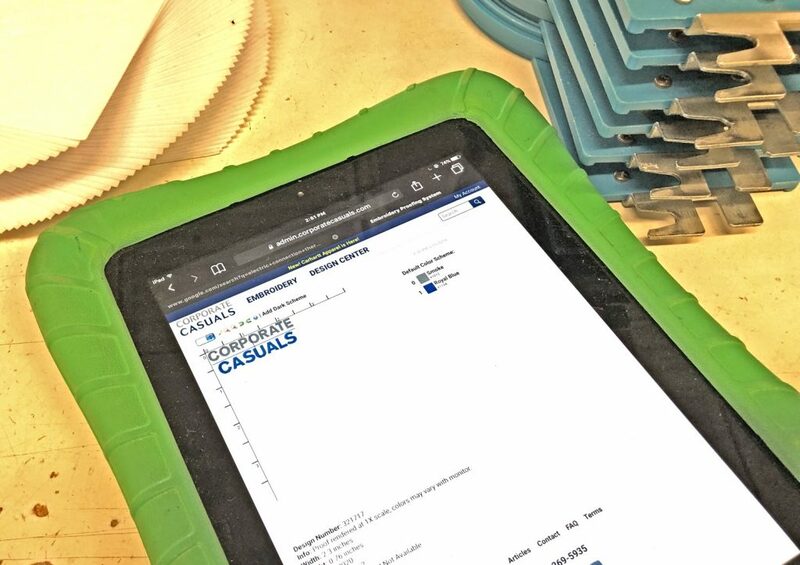 Our online proofing tool can render these DST files with the thread colors you select. The logo you see in our proofer is exactly the same as what our production floor sees. Our entire production staff is equipped with iPads to save trees and improve accuracy. Every person on our shop floor has an iPad. We install them in green foam cases designed for kids…they work well for adults too! Our Prices Are Better, Period! Venture capitalists don’t give you 40 million dollars because they are nice guys. They do it because they expect to earn a 20% return on their investment. Who pays for that return on investment? You do! Let’s compare pricing, shall we? The K500 Silk Touch Polo Shirt is one of those ubiquitous polo’s that everyone sells. The K500 is roughly a $16 polo shirt decorated with a small logo. 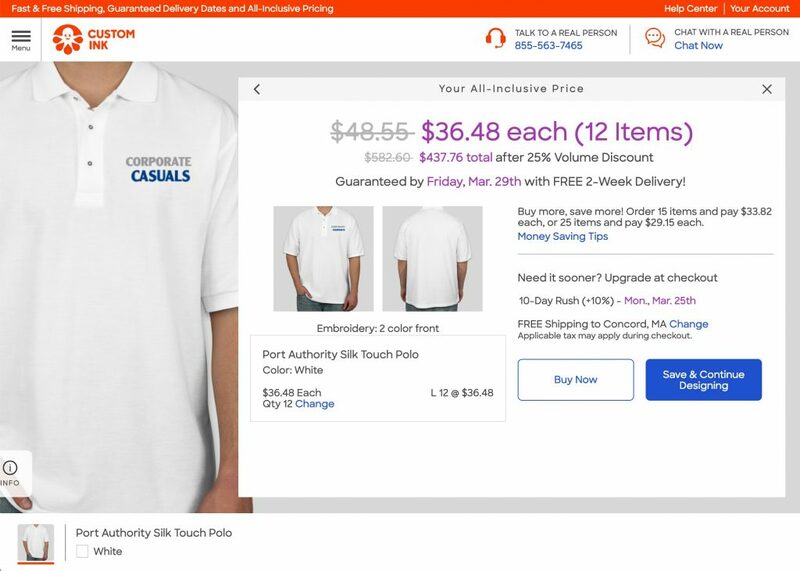 Here is CustomInk selling that polo for more than $36! It slices, it dices, this silk touch polo a $48 value, yours today for the low price of $36!!! What we find disturbing is the pretense that this polo is somehow worth $48. Marking up a product only to mark it down it the oldest sales trick in the book and no one believes it anymore. Do you really want to do business with a company who tries to fool you with fake marked down pricing? 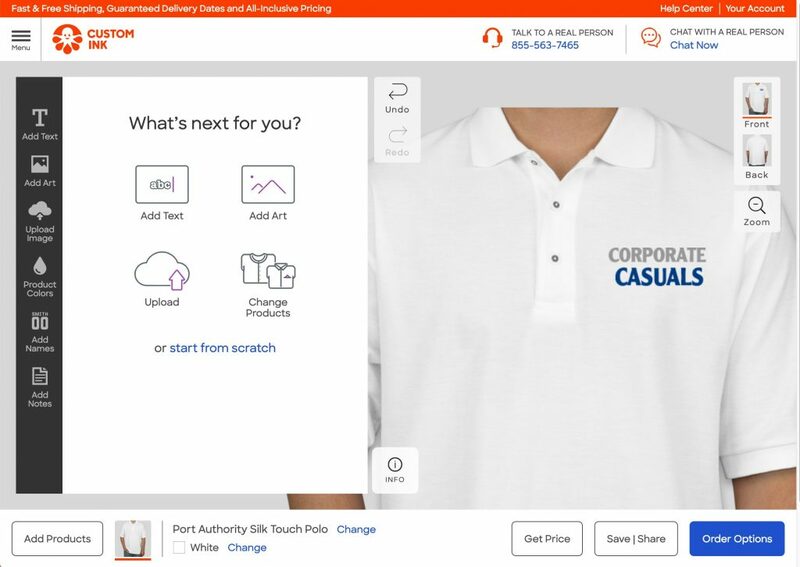 At Corporate Casuals we will sell you a dozen Silk Touch Polos with your logo for about $16 each. That’s not a special price, there are no coupons, first-time offers, or any other sleight of hand tricks. 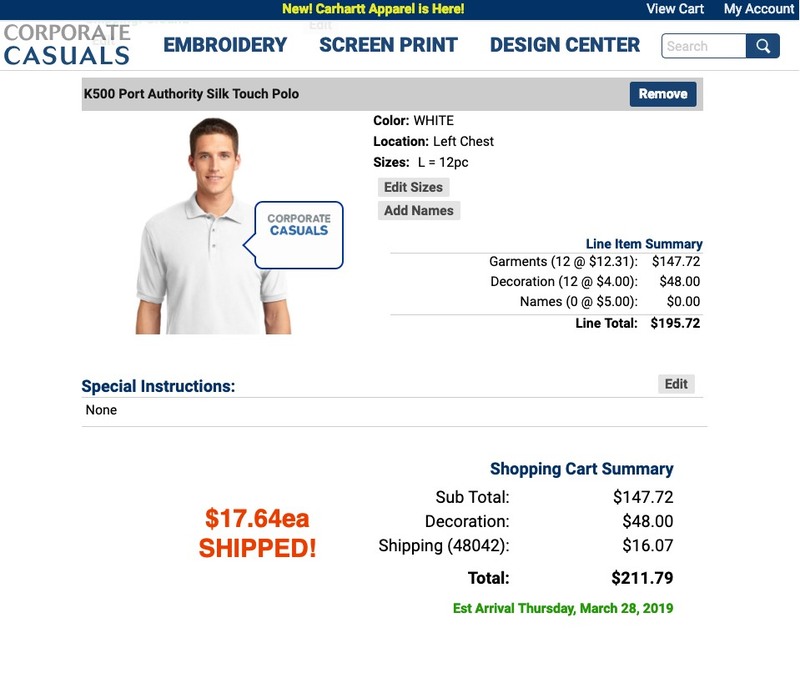 Our every day decorated price is a bit less than $18 for a dozen polo shirts with a logo created in our design studio shipped to the east coast. If you upload your logo, there is a one-time setup fee that will bring the price up to just under $21 per shirt. Notice that we are completely transparent with our pricing. Every charge is clearly listed so you can shop around. We believe that “used car salesman” tricks have no place in our industry. When you set up an embroidered logo with us, it’s yours! You can download that DST file and give it to any embroidery shop. Tajima DST format is an industry standard. Yes its true we are David shooting stones at Goliath with this page and we really do admire CustomInk. They have brought customized apparel to the masses and all decorators have benefitted greatly. Our goal with this page is to simply let you know about a little family owned company in Concord, MA that does some great embroidery work. We hope you will give us a chance to serve you. Pro Tip: Anytime you place an embroidery (from anyone) order ask for your artwork files. Any shop that refuses or tries to charge you is not a place you should be spending money.